Five weeks after Zeemote ceased operations it was announced Thursday that the assets of the company have been sold off to Aplix Corp. The obvious question then is who is Aplix? Aplix Corp is a Japanese based company that creates a JVM / KVM called JBlend that it licenses to handset manufacturers. I've seen JBlend on older Motorola feature phones (like the RAZR and PEBL) as well as few Windows Mobile devices. As far as I know though they have very little market share in the US or in Europe. It seems like an odd marriage but hopefully they can help add Zeemote support to more games and devices and to improve the overall user experience. I also hope they allow, encourage, and aid in getting the Zeemote supported on non-JBlend devices since MIDP (Java ME) based devices (Aplix core business) are quickly dying in favor of more capable smartphones. Just Friday the press went wild with reports of the rising success of the java-hating iPhone in Aplix's home turf of Japan. Congrats to those at Zeemote who got the deal done and are continuing on. I decided to turn down their offer but will be watching and rooting for them to turn this into a success. Good luck. Among my first lessons learned at Zeemote, Inc. is that hardware is hard and in my opinion start-up companies should avoid getting into the physical product business if at all possible. For some time I believed that physical products held a huge advantage over software-only products. Consumers are after all used to paying for items that they can touch and feel whereas most software these days seems to be free. The high barrier to entry of the hardware market also ensures that you will see much less competition than you otherwise might. Having said that, I now feel that the disadvantages of creating hardware products far outweigh the advantages. The barrier to entry is high for a reason and it is not just your competition that needs to cross it! Compared to software, hardware is several orders of magnitude more expensive to prototype, manufacturer, and distribute. One software engineer can develop a basic demo in a matter of hours and the manufacturing / distribution costs approach zero. Creating and distributing a hardware product requires much more expertise across a wider range of domains. It requires hiring more staff and partnering with outside (and expensive) vendors. An initial prototype may not be seen for months. If you make it to manufacturing, each unit you build costs money and everyone along the value chain needs to get paid. You must figure out how to distribute the product and manage all the logistics it entails. You also need to carefully manage inventory which is non-trivial since forecasting demand of a new product is almost impossible. The larger (but related) issue is that of iteration. Start-ups are usually attempting to create a new market or segment an existing one. A start-up is usually founded on some hypothesis which almost always turns out to be wrong. Experienced and successful entrepreneurs will tell you that the key to success is through experimentation, learning and iterating on your product idea. Get your product into the market as quickly as possible and modify it based on what you learn. Often the final winning product bares little resemblance to the initial idea. The sad reality is that today the costs of manufacturing and distributing hardware makes iteration impractical for most. If you don't get it right the first time then you are dead meat. Unfortunately at Zeemote we spent much more time dealing with the basic issues of just bringing the device to market than we did (or could) on iterating the product based on user feedback. If you are considering a hardware product I'd urge you to think long and hard about it. Is there any way that you can develop an initial version or a similar product that doesn't require hardware? I think a good example of this done right is Boxee. They provide an internet media streaming service that ideally would run on a dedicated set-top box connected to your TV (like your cable box). When Boxee launched however they did so with desktop software only (no hardware). This let them test their product idea and build a user base. Sure, ideally, it would be a set top box but the software allowed early adopters to try the service and provide feedback. It wasn't until this week that they announced a dedicated hardware device. Smart move. I don't see myself getting into the hardware business again any time soon but if I do you can be sure it will have a software-only strategy at launch. I'm disappointed to report that last month my (now former) employer, Zeemote, Inc. laid off its staff and shut down operations. The news was first reported in Mass High Tech the day after it happened a few weeks ago. According to investor Michael Fitzgerald of Commonwealth Capital Ventures, the company has shut its doors, but he declined to offer any further details of the closure, except to note the plans to sell Zeemote’s assets. I spent three and half years at Zeemote, Inc. That may not sound like a long time but in the world of start-ups and the mobile industry in particular that amounts to several lifetimes. Remember that back in 2006 the number one cell phone was still the Motorola RAZR and few people could envision high quality games or applications ever running on mobile phones. I joined the company back then as the first full time hire after the founders. Like all roller coasters this one had lots of ups, downs and unexpected turns. During my tenure I had 4 different bosses and 3 different CEOs. We worked in 2 different office buildings and saw the company renamed. We celebrated a few big launches and deals but were disappointed by the failure to close many more than we landed. We had a few hiring sprees and two major layoffs, the last of which was my own. The failure of the product and company is a huge let down for everyone involved. A lot of time, money, and heart went into this effort but we ultimately failed. With that said, Zeemote was undoubtedly the best professional experience of my life. I strongly believe that failure can provide the best learning experiences and this is no exception. We did a lot of things right at Zeemote but we also made a ton of mistakes. The lessons I learned here will stick with me for years and I hope (in due time) to share many of them with you on this blog. For now I'm officially one of the many unemployed but I'm very excited and optimistic for what is next. UPDATE: After this post several readers sent me invites. I now have an account. Thanks! Last year I was lucky enough to get early access to Google Voice (formerly Grand Central). How? Well I just logged in to blogger, google's blogging software, and there was an invitation just waiting for me. This is a great marketing strategy for Google. Create a new service and provide early access to bloggers since they are very likely to write about said service and build buzz around it. I haven't been writing much lately but I really want a Google Wave account. I logged in to blogger today for the sole purpose of finding a Wave invite. Unfortunately nothing. Come on Google, let me try Wave! Last night I ran in an organized 4.2 mile run as part of the "Lets Run Series". It was great. Several hundred people were in it and at the end you are treated to a food, beer, and live music. If you enjoy running I encourage you to check it out. Unfortunately these events sell out quickly and if you are not already signed up for the final runs you will probably have to wait until next year. I've been stuck having to use the MS command prompt a lot lately because some of the tools I'm using at the moment don't work under Cygwin. I needed to figure out which installation of an app was first in my PATH and I longed for the which command. Ask [google] and you shall receive: which for Windows. http://gnuwin32.sourceforge.net hosts a number of standard unix apps that have been ported to Windows and do not require Cygwin. I was surprised last week to find that my C:\ drive was completely full. Using WinDirStat (thanks for the link Paul) I was able to analyze the drive and see where exactly the space was being used up. The largest disk hog turned out to be Google Desktop which was consuming over 4 Gig of primary C:\ real estate. Google Desktop is essential for searching files on your desktop and especially useful for searching mail in Outlook but it consumes huge amounts of disk space over time. Google doesn't provide a user setting for where to store the index but there is a registry key you can modify to get the job done. This allowed me to move the index to my D:\ drive clearing up space needed on C:\. If Obama and the Democrats are serious about restrained and responsible government spending they should pass a constitutional amendment to finally give the President the much needed line item veto power. We need this today more than ever. I just read an article about how a few senators have modified a defense spending bill to appropriate $1.75 billion for outdated F-22 fighter jets that the President and the military don't want and consider wasteful. Why the spending? The jets are made in the senator's home states of course. Obama is now considering the unusual action of vetoing a bill that his own administration primarily wrote! The president's not alone in opposing the change. He's also got the Democratic chairman of the Senate Armed Service Committee, Sen. Carl Levin, and his former GOP rival Sen. John McCain -- a war hero himself -- on his side. But with jobs on the line, other senators are putting up a fight for the F-22. Today most US state governors have the line item veto but sadly the President of the United States does not. Actually for a short time President Clinton did have this power and he used it 11 times. Bob Dole and John McCain introduced and passed the Line Item Veto act in 1996 but in 1998 it was ruled unconstitutional by the Supreme Court in a lawsuit against it by then NYC mayor Rudy Giuliani. A constitutional amendment or a modified version of the law is now needed to legalize it. This power is over due and desperately needed. Now is the time to pass it. It would also happen to be a great way for Obama and the Democrats to fight the public's growing concerns over uncontrolled and wasteful government spending. Today Android announced official support for native development via the Android Native Development Kit. This is a huge step forward for the platform. Yea, I love my Java but not having a native C / C++ option makes it impossible for developers to port many popular desktop applications & console games. Without C / C++ you could never see apps like Firefox, Google Earth or a halfway decent version of John Madden Football running. Currently the NDK doesn't support a native UI so for the time being developers will need to use Java as the front end and interface to C / C++ via JNI. Lack of a native interface remains a huge weakness of the BlackBerry platform. BlackBerry has no real Operating System per say. In fact they don't even refer to it as an Operating System but rather as "Device Software". The lowest level software RIM has is essentially the JVM. I've heard RIM describe the architecture as "Java on the metal". Luckily the entire BlackBerry platform should be fairly straightforward to port to a full Operating System such as Linux. In this way they could add support for native development while maintaining full backwards compatibility with existing applications. And in fact they have essentially done this already! The BlackBerry Application Suite runs atop Windows Mobile and runs most of the platform. BlackBerry and Microsoft continue to look like a perfect match for each other. If it doesn't happen I sure hope RIM is busy at work porting the platform to Linux. Events in Iran are are occurring in such a drastically new way and at such speed that I'm not sure I have a good grip on what yet to think of it all. Below are some miscellaneous thoughts. With text, images, and video coming directly from the people involved this is the closest I've ever felt to war (if you can call this a war). Sad when my own country has been at war for several years. Everyone should be watching and reading at least some of these accounts. The Neda videos (here and here) are terrible but not watching is either not fully understanding, ignoring or denying. Should the U.S. get involved? Twitter is a very effective communication tool but it is very noisy and it is impossible to verify the accuracy, truthfulness, or the real source behind the messages. Twitter is a great propaganda tool. Has the U.S already been involved? Will this fizzle out in a few days or are we seeing a true revolution? All countries are far more fragile than we think. Suggestions of election fraud with or without basis threaten the stability of a country. Should suggestions of election fraud without basis be considered a criminal act (like saying "fire" in a crowded theater)? Should it be considered a treasonous act? Thoughts are with the Iranians protesting for and dying for free speech and free elections. Congressmen Ask Fannie and Freddie to do What? Congressmen Barney Frank and Anthony Weiner have written a letter to the CEO's of Fannie Mae and Freddie Mac asking them to lower their lending standards. Many people (myself included) believe this is a big part of how we got into the housing crisis in the first place. Amazing. Two U.S. Democratic lawmakers want Fannie Mae and Freddie Mac to relax recently tightened standards for mortgages on new condominiums, saying they could threaten the viability of some developments and slow the housing-market recovery, the Wall Street Journal said. Check out this interesting slideshow from businessinsider.com showing the first jobs of a few famous CEOs. There is a good Op-Ed in the Washington Post by George Will criticizing the government bailout of GM. In it he points out that today the the market cap of GM is roughly equivalent to that of California Pizza Kitchen. Java One kicked off today and the big announcement, as expected, was the Java Store. They are further along than I expected. They have a private beta site up and running and are accepting applications for testers now. Verizon announced today at Java One that it will begin supporting Java ME. Wish they did this 4 years ago! Lowell McAdam, president and CEO of Verizon Wireless, who will outline his company's strategic decision to deploy Java Platform Micro Edition (Java ME) -based services in its network and offer Java-based services and applications to its subscribers. Obviously short on details but we will certainly learn more soon. It is unclear how widely the support will span (most devices or just a few) nor is it clear what will happen to BREW now. Last year I mentioned how Google was offering free voice mail service to the homeless. The idea is to give people (think welfare officials, doctors, family) a way to leave messages for those who can be difficult to find and get in touch with. Well that is sooooo 2008. I just read an article in the Wall Street Journal about how the homeless are getting on the internet. They are surfing the web, doing email, and even using social networking sites. It profiles Charles Pitts who says he has been on the street for two years and has accounts on Facebook, MySpace and Twitter (see @poetcharles). In the United States we have been blessed with the freedom of speech since its founding. Only now however do we have the tools that enable all of us (regardless of economic class) to exercise that freedom on such a massive scale. The fact that individuals from @poetcharles to @mpv to @APlusK can now communicate and publish their thoughts and experiences on identical platforms is mind blowing. One day our kids will study these technologies as we did the printing press. A year and a half ago I noticed and joked about how Sun was advertising other products from within Java Update on the PC. In a video blog posting today Sun's CEO, Jonathan Schwartz, discussed the success they had distributing Google toolbar via Java Update and announced that they will build on that success and extend it to become a full fledged / general purpose App Store!? With an installation base of "approximately a billion users", he says, it "has the potential to deliver the world's largest audience". As with other app stores, Sun will charge for distribution - but unlike other app stores, whose audiences are tiny, measured in the millions or tens of millions, ours will have what we estimate to be approximately a billion users. That's clearly a lot of traffic, and will position the Java App Store as having just about the world's largest audience. Presumably it will work across all Java platforms. More details to come in a few weeks at JavaOne. Sony Ericsson and Zeemote have announced a partnership to launch a console-style controller for a mobile handset for the first time in the UK. The Sony Ericsson W705 Walkman will be available exclusively with T-Mobile and is to be bundled with the Zeemote JS1 Bluetooth Mobile Gaming Controller and pre-loaded with the Fast & Furious game. Check out this video of the Zeemote JS1 being used with an iPhone game. Much better than having to tilt your screen around huh! Take a look at this image to get an idea for the size of the universe. Incredible. 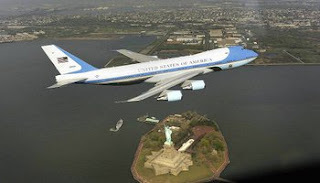 I read an article today about the now infamous picture of Air Force One that cost tax payers an estimated $330,000 to capture. While reading I started to wonder what the most expensive picture ever taken was. I searched around and couldn't find the answer to that exact question but I did find a list of the most expensive photos ever sold. Currently topping the list is a photo called "99 Cent II Diptychon" which sold for $3.34 million at a Sotheby's auction in 2007. It depicts "an interior of a supermarket with numerous aisles depicting goods resulting in a colorful work". What would you have paid for this? a collection of 24 shipping containers, arranged into a multilevel retail store, bar, and event space, more closely resembles a set of giant building blocks than an actual metropolis. set up at Fan Pier, close to the Institute of Contemporary Art, for three weeks as part of the Volvo Ocean Race - a nine-month yacht race around the globe. At each stop of the race, sponsors such as Puma set up a small village of temporary buildings for racers and their support crew. There are also offices, changing rooms, and flat-screen televisions for watching live feeds of the race from the bar. On the third level, a cantilever deck reaches toward the ocean. Boston is the only US location that Puma City will visit and only the second city where the structure has been assembled for the public. The structure will stay in Boston through May 16. Before it moves on to its next destination in South Africa. A few weeks ago while at the beach in Florida I saw two guys "Kite Surfing". I've never seen or even heard about this sport before. It is basically snowboarding on water with the power of a giant kite. It pulls you pretty hard and lets you do extremely high jumps. I was talking to a friend about it last night. Apparently you can take lessons and get rentals in Boston for a few hundred dollars. I have to try it this summer! Unfortunately, there have been a few terrible accidents. Check out this video of a guy being pulled out of the water and into the side of a building! Ever buy something online and feel a bit cheated while checking out because you see an option to enter a coupon / promotional code but don't have one? Use the power of Google! This Mother's Day weekend Google saved me $10 by doing a quick search for "1800flowers promo code" before completing the check out. At the 2009 Nokia Developer Summit, MySpace presented at a session in which they described their experience in mobile and the trends they see moving forward. During the talk the speaker mentioned a term they use internally that I'd never heard before: "Enhanced Featured Phone". As soon as he said it I knew exactly what he meant. It's a class of phone that is a step up from your basic "Feature phone" but doesn't quite reach the "Smartphone" category. It has a much better browser and multimedia experience than feature phones but doesn't have the operating system or programming environment of the iPhone, S60, or Windows Mobile. The Samsung Instinct and the LG Dare immediately jump to mind. There has never been a good definition for labeling the various phone categories and any attempt ultimately fails or proves useless anyway. By some people's definitions for example the iPhone shouldn't be considered a smartphone because of the closed nature the app store. Since returning from the Nokia Developer Summit, Qt as weighed heavily on my mind as a potentially excellent C++ mobile cross platform development solution. I still need to better understand how well it will work in practice though and what the limitations of using it are. I found the following demo video on the Qt website and I have to say it is quite impressive. It shows a set of Qt applications running (supposedly unchanged) across embedded Linux, Windows Mobile, and S60. Last week I was lucky enough to attended the 2009 Nokia Developer Summit in beautiful Monte Carlo, Monaco. Not a bad destination to have to travel to huh. The conference was split into two tracks, Technology vs Business, and I attended the technical sessions. I thought the overall theme was Nokia attempting to make the case that it is they who offer the most OPEN and developer friendly mobile platform today. They first acknowledged the difficulty of Symbian C++ as a programming environment and presented two new technologies to improve S60 development moving forward (and likely leaving Symbian C++ behind). As you may remember when the iPhone first launched this was the only method of programming for it. It appears that Palm’s WebOS (i.e. Palm Pre) will only support this model of development. Many (most?) applications today are being developed with these web technologies so it is great to see Nokia embracing that community. To help make the point of how easy widgets are to create Nokia held a “hackathon” competition where by which developers competed to create cool and useful widgets over the two day show. Qt (pronounced as "cute”) is a well known programming “toolkit” for developing cross platform C++ GUI applications. The idea is that you develop your application using Qt and (in theory) it should be able to run unchanged on Windows, Mac, and Linux. Developing cross platform C++ GUI applications has traditionally been an extremely difficult task to achieve. Google Earth is one well known product that uses it. There has been some controversy and resistance to this product though because of its non-free license. In June of 2008 Nokia acquired the company (called Trolltech) and immediately made the license completely free and announced that it would soon support S60. This means (again in theory) that one could easily develop a C++ GUI application that runs on Windows, Mac, Linux, S60 and Windows Mobile unchanged. Pretty damn cool. A developer asked about iPhone support and the speaker said that technically it is trivial to add support for but currently Apple’s terms and conditions forbid it (insert expletive here). Qt supports bindings to OpenGL, the standard 3D graphics API, so it is not hard to imagine game developers choosing this technology to create excellent cross platform games. To help make the point of how easy Qt development is a presenter created a Qt C++ “web browser” application live on stage in 5 minutes. This is something that certainly couldn’t be done with Symbian C++. One question that remains unanswered is the future of “Maemo”. Maemo is an open source mobile platform based on Linux. Nokia uses it on the N810 “Internet Tablet”. It supports VoIP but it does not (currently) support traditional telephony technology. Based on Linux it already supports many of the open and standard technologies described above that S60 is trying to add. There has been speculation that perhaps Nokia is secretly planning to make it the smart phone platform of the future and either leave S60 behind OR relegate it to low / medium end devices. When asked about the Maemo vs S60 question the presenter essentially gave no answer. Overall I thought the conference went very well. Personally I found it very heartening to see Nokia acknowledge weaknesses of their platform and present technologies that I do think could make a big difference moving forward. They are slow but I think moving in the right direction. Video and slides from the event are available on the 2009 Nokia Developer Summit site. BlackBerries to Have Optical Trackballs? Rumors are that the BlackBerry Curve 8520 (AKA Gemini) will sport an optical trackball. Support for the embedded Standard Widget Toolkit (eSWT). eSWT is a UI toolkit for Java and is a subset of the desktop SWT (which is what Eclipse uses). Although I haven't used either it is presumably a much more powerful toolkit than LCDUI. One cool aspect of eSWT is that it runs in pretty much any java environment including the desktop. Support for updating the VM on the S60 devices. Until now users needed to upgrade the entire OS to get a new VM but now it will possible to update it separately. In theory this should mean more frequent bug fixes / updates. I did have to roll my eyes a bit when I saw the three supported "security policies" for S60 devices. It seems that almost every carrier in the world can live with one of the first two. Java Native Interface (JNI): MIDlets can invoke native services. While JNI would be great I'm assuming for the moment that this is not something that is generally exposed. We'll see though. Lets say you want or need a new feature in a software product. How do you go about getting it added? Last week, for perhaps the first time in my life, I was actually able to achieve this feat! Here is my advice. First contact technical support to confirm that the feature does not already exist. Then forward the confirmation to sales and explain further what you need and why you need it. It will help if you say how much you love the product and that "unfortunately" you will need to switch to a competitor if said feature does not get added. It is worth noting that it is OK to contact sales even if you don't pay for it. Mine for example was a free web service. In the past I've made the mistake of sending feature requests directly to technical support or engineering. Engineers like to think that engineers run the world but alas this is not the case. New features are driven from sales & marketing not engineering. You are often far better off lobbying sales directly for the feature than if you rely on technical support / engineering to lobby for it on your behalf. Here is a video of the Zeemote JS1 being demoed at the 2009 Game Developer's Conference in the Nokia N-Gage booth. Fairly typical JS1 users I think. Unfortunately I did not get to attend this show. I've been trying to get myself back into shape lately. It has been a long winter and the softball / kickball seasons are just around the corner. I gotta get back into playing shape if I want to return to Vegas this year. Right now I'm running two miles a day at an eight minute mile pace. Not terrible but I have a long way to go to get back to my peak of five miles a day at the same pace. An eight minute mile works out to be 7.5 mph. Tonight I started to wonder what kind of pace marathoners run at. A marathon is of course 26 miles long. Could anyone possibly run an average speed of 7.5 mph over 26 miles? As usual I turned to wikipedia. In September 2008 Haile Gebrselassie of Ethiopia set a record marathon time of 2 hours, 3 minutes, and 59 seconds. That works out to be (on average) a 4.8 minute mile or 12.7 mph. Damn. So when I stop after 2 miles he has already done 3.4 and could continue for another 22.6. 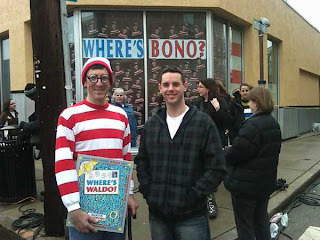 Last week I wrote about the rumor that U2 was playing a secret concert in Somerville. That posting was one of the top search results on google for "U2 concert in Somerville" and I got a bunch of traffic from it. Pretty cool for just linking to someone else's news story. Well the rumor is legit. I had an eye appointment near there today and passed through Davis Sq. Lots of activity going on and had a few minutes so I stopped to take some pictures. Check out twitter / twitpic if you are interested. The best one yet came after I finally found Waldo. Apparently he is a U2 groupie and was taking pictures "for charity". I walked down there tonight to check out the scene. Lots of people hanging out in the square walking around and eating ice cream. Everyone was really excited and trading theories about where the band was and where they might be going after the show. One guy claimed that they would surely be going to The Burren because he's "pretty sure" they know the owner. Even though I'm not a U2 fan I think it is really cool for our town. In 1999, as Computer Science undergraduates, my friend Tim and I participated in the ACM Student Research Competition. We submitted a paper and were invited to New Orleans to present our work at the conference. For me the most memorable part of the trip was listening to, watching, and briefly meeting Richard Stallman who delivered the keynote at the awards dinner. In geek circles Richard Stallman is referred to only by his initials & username "RMS". He is a living legend in the software industry and is extremely controversial for his views on software licenses, intellectual property rights, and politics. While many disagree with him on some of these topics (myself included) no serious person can debate his genius or his contribution to GNU Linux and the free software movement. He is also well known for his physical appearance. If you saw him on the street you would probably avoid eye contact and cross to the other side assuming he was homeless, crazy or both. Inside this conference hall though people hung on his every word and lined up for hours to meet him. I watched (and was part of) a crowd entranced by their Messiah. It was fascinating but I don't think Tim was quite as impressed as I was. The topic of Stallman's talk was interesting but at the time it seemed a bit far fetched and idealistic to me. He discussed the idea of creating a free online encyclopedia where by which teachers around the world would contribute articles (for free) on the topics they knew well. It seemed like a good idea but I had trouble imagining it ever really working. I didn't think about his talk much after the show ended. 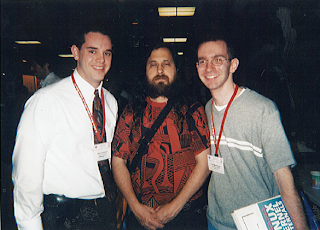 Two years later, in 2001, Wikipedia formally launched and it wasn't until a few years after that when I recalled the topic of the RMS talk and made the connection. I guess the lesson is to always listen carefully to industry leaders speak. They might just tell you the next big thing. The picture above is one of my only "celebrity pictures" but my non-CS friends and family always have to ask me, "Who is that bum you are with?" To which I reply "Oh, that's just my friend Tim." Rumors are spreading that U2 will be having a "secret concert" on Wednesday in Somerville, MA at the Somerville Theater in Davis Square. That theater is smaller than my middle school auditorium. Wonder if it is really going to be U2 or just Improv Everywhere? Bono, if you do come to my town make sure you don't take a cab. While I was at college the internet boom was exploding. Everyday it seemed I would read about another technology IPO that I had missed out on. "Pets.com raises over $80 million", what!? I wasn't jealous though. Mostly I observed the news in awe. The world of Silicon Valley, start-ups and IPOs was still completely foreign and intangible to me. It was something I just skimmed headlines about. I could hardly imagine what my own life would be like after school. A 40 hour a week that doesn't involve slicing meat or serving sandwiches? Then one day a PhD student I worked with with gave me a book and demanded I read it. For better or worse it changed my life. It was called Netscape Time: The Making of the Billion-Dollar Start-Up That Took on Microsoft. For the youngins out there Netscape was the first hugely successfully web browser and it ultimately led to Firefox. I started the book that night and didn't go to sleep until I finished the next morning. The book details the incredible rise and fall of Netscape Corp. The team consisted of several recent computer science students (like me?) led by co-founder Marc Andreessen. Together they worked extremely hard to create a software product that would change the world. And as if bragging rights for doing that wasn't enough they all became multi-millionaires after Netscape had its historic IPO on Wall Street. That night I was bitten, hard, by the start-up bug. Single-handedly the book gave me my first peak into a world I had only vaguely known existed. It gave me a new dream. Of course I don't have illusions of a Netscape life (well, not anymore!) but the concept of owning equity in a company and working really hard with a great team to build a cool product appeals to me at the deepest possible level. After reading the book, Marc Andreessen became a bit of a hero of mine. I linked to him from here once before. Surprisingly though I had never heard him speak. That is, until last night. I was thrilled to tune into Charlie Rose and see that he was the guest for the hour. When you have the time check out this terrific interview. Last night a man in Somerville, MA (my neighborhood!) got shot in the leg and then got himself arrested for car jacking a cab, kidnapping the passengers, assault and battery with a dangerous weapon and reckless operation of a motor vehicle after he crashed into a man he now alleges was the shooter. My grandmother on my mother's side was born in Ireland so despite my German last name (O'Vosseller?) I am in fact more Irish than anything else (except perhaps American!). Anyway a few years back my parents returned from a trip to the Emerald Isle with exciting news. They learned that Ireland offers citizenship to anyone with a parent or grandparent who was native born there. Most importantly (to me at least) is that there is no need to give up U.S. citizenship because both Ireland and the U.S. allow dual citizenship with one another. Benefits that come after living in EU for some amount of time include: health insurance, pension rights, voting, social service, discounted college tuition, unemployment compensation, etc. Another important benefit is that getting this done before having kids will make them eligible as well. As the world flattens and international business grows in the coming years I think that dual citizenship could become quite valuable. I haven't acted on this sooner because for several years I was working at a defense contractor which prohibits it. Now I'm thinking about it again. I'm writing this first to let others know about the option. If you have Irish roots look into it here and contact your local embassy/consulate. But really I want to ask if you know of any reason why I shouldn't do this? The only reason I can think of is that it would limit my ability to return to defense work. Am I missing anything? What else should I consider? This morning on This Week Robert Reich accused Republicans of voting against the near $1 trillion stimulus/spending package for political self interest. Reich said he believes the economy is unlikely to be better in two years than it is today and accused Republicans of voting against it only to help themselves in the mid-term elections. You are reducing to tactics what is actually in this case a matter of principle and philosophy. Politicians of all parties often cast their opponent's actions as "playing politics" but one can't effectively do that when those actions are in line with their stated beliefs. A better case of Republicans "playing politics" would be the last 8 years of unprecedented spending which I think was an attempt by them to maintain power at the expense of their philosophy and our economy. A while back a friend shared an impressive video by Animusic. Both our graphics and music are entirely digitally synthesized. We “invent” imaginary Virtual Instruments by building computer graphics models of objects that appear to create the sound of the corresponding synthesized music track. Virtual Instruments range from being reminiscent of existing instruments to arbitrarily abstract. The best experience is to download the full HD video and watch it off your computer. Right click the following link and choose "Save Link As" or "Save Target As" : http://www.animusic.com/downloads/Animusic-ResonantChamberHD.mov. It is a very large file (280 MB) so be patient. See their other downloads here. The Gadget Show in the UK featured the Zeemote JS1. Watch the video and jump to 4:10 and 7:30 to see what they say. Gadget Show UK - Zeemote Rules from Glenn Kiladis on Vimeo. Over the last few weeks I've been trying out the music streaming service Last.fm. I love it and it has changed the way I discover and listen to music. This will be old news to you if you've seen my friendfeed (via Facebook or the new sidebar of this blog) because it reports my recent activity there. At its core Last.fm builds and delivers an internet streaming "radio station" customized to you based on your music collection, listening habits and preferences. It can also suggest additional music that you are likely to enjoy and best of all, it actually works! I've already found some good stuff I had never before heard. It learns and predicts what you like in a number of ways. First it provides software that plugs into your media player (like iTunes) to see what music you have and how often you listen to each track. You can also manually "love" or "ban" individual songs through the web interface or with Last.fm player software. Once you ban a song it will never be played to you again. Brilliant! I love banning songs. It is mischievously powerful. The magic of the site stems from its database of 20 million plus user profiles because it allows them to make good suggestions to you based on what people with similar tastes enjoy. This level of interactivity and customization can't be matched by more traditional one way broadcast medium like AM/FM or satellite radio. I've been a subscriber to Sirius XM satellite radio for a few years now but I'm very close to canceling. The satellite coverage is spotty, the web streams are just re-broadcasts of the satellite stations, and they just recently announced that subscribers will soon need to pay an additional fee for web access. There are only two reasons I haven't canceled yet. The first is because there isn't Last.fm player software available (yet) for my phone (currently Blackberry), so I can't listen in the car. The second is that there are one or two non-music stations (talk & news) that I enjoy which aren't easily accessible from my phone either. Neither reason will keep me from jumping for too much longer. Satellite radio has billed itself as the terrestrial radio killer so I found it ironic to learn that while Sirius completed its $5 billion (that's billion with a b) acquisition of XM, Last.fm was purchased by none other than CBS Interactive, a sister company to CBS Radio, for $280 million (with an m). The future of music is definitely personalized and interactive streams over the internet. I recommend you try out Last.fm. I hear Pandora offers a similar service but I haven't tried that one out. Frequently while building a software product the stakeholders will disagree on a proposed feature and a seemingly endless and tedious debate ensues. Occasionally some will use intellectual dishonesty to "win" the debate. I have seen for example dishonest programmers artificially inflate time estimates (to implement the code) in order to tip the scales of the argument against a feature they don't like. The other point is that it's important to make prototyping new ideas, especially bad ideas, as fast and easy as possible. If you are an honest programmer who really cares about your product you won't turn to intellectual dishonesty. Be open to ideas from all stakeholders. Make your software design flexible so that new features can be quickly prototyped and experimented with. The faster you can implement features (good and bad ones) the faster your software can evolve and improve. Working code has a way of clarifying arguments. I have certainly implemented stuff I thought was bad on paper but worked great in practice (and vice versa). Superherostuff.com is now selling a Barack Obama "super-hero" T-Shirt for $17.99. What about the rest of the cabinet? Perhaps Batman Biden? Or Catwoman Clinton? I wish I had photoshop skills. 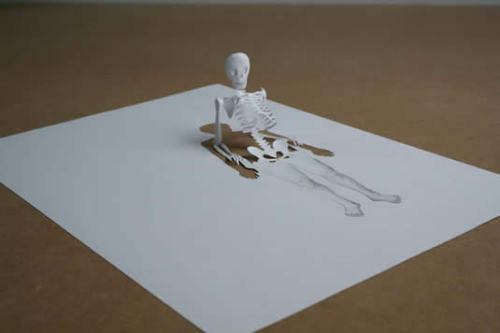 Paul shared a link to an article on "papercut" art by an artist name Peter Callesen. Go check out his website and his selected works. They are amazing. Nokia just announced a deal to bundle a Bluetooth heart monitor and an application called SportsTracker with the N79 in a promotion called the N79 Active. Nokia SportsTracker is an application that runs on your phone and uses the onboard GPS receiver, accelerometer, and data connection to track your workouts. Data is then uploaded to your account on the SportsTracker website. Users can track miles ran, heart rate, average speed, and the music they listened to at various points in their workout. "We are recruiting right handed males for a drug study. This involves an FDA approved drug. 1 screening and 2 MRI scans. Pays $350." Check out the "Sixense’s TrueMotion game controller"
It looks very much like Nintendo’s Wiimote and the basic idea is the same. But TrueMotion uses a base station that creates an electromagnetic field to provide much, much, much more precision than the Wiiremote. Excellent op-ed by Thomas Friedman this week arguing that the upcoming stimulus package needs to focus less on infrastructure projects (roads and bridges) and more on educational stimulus. Perhaps we could call it "intellectual infrastructure"? When I was a Computer Science student in college most of my classmates were from either India or China. I think it is insane that we don't make it as easy as possible for these highly educated and highly skilled individuals to stay and work when we have such a shortage of qualified workers here. Right now we are just encouraging them to return home to create companies that will compete with ours. The Zeemote website just relaunched and it looks amazing. I wish I had the design and artistic skills to create a website as good as it. Bravo to the team who got it done. I write very very very slowly. It's just one of my several weaknesses. That combined with the fact that I get swamped with email means I often feel like I live in MS Outlook. Often times I receive a short one line question over e-mail that requires a multi-paragraph response. By the time I'm done I may have invested 15-30 minutes and all too often what happens next is another brief email asking for further clarification! Usually the person is unaware of the complexity of the answer or the time it will take you to compose it. Sometimes however the person is simply looking for a "cheap" answer in which they don't need to invest their time. Voice would be easier. Let's discuss tomorrow. My New Years resolution is to make that a template email response and use it frequently.